Our suburbs are getting squeezier, no doubt about it. Speaking as I am from a cramped flat in inner Melbourne which I share with a tall man, a fat dog, a needling cat, two messy children and an incubating fetus, I feel I have some first hand experience with this problem. But it’s not a problem restricted to those of us occupying the inner city. Plots of land in outer suburban developments continue to shrink in size, and with property prices so criminally high ( I mean, really- this is not the goddamn Cote D’azur we’re talking about here- why the stupid price tags for a simple home?) many of us are being forced to occupy smaller premises than we’d ideally prefer. There are canny solutions, however- if you just know where to look. 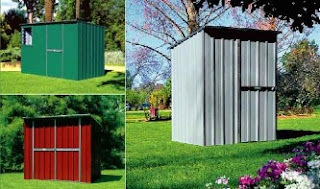 National Sheds do a fine line in backyard sheds that add value and style to your property, and provide the significant bonus of being detached from the rest of the house. This means that even the most smelly and anti-social of pursuits can be indulged without bothering the sensibilities of your fellow housemates. The humble backyard shed has come a long way from the days when your Dad would get loudly shickered of a Sunday arvo, announce his plan to erect a shed- ‘a real man’s shed!’ and proceed to limply assemble a shamefully shambolic structure that became a blight on the backyard. Sheds these days are so sturdy and practical, in fact, that they can easily be used as guest sleeping quarters or a teenage retreat. The only limit is your imagination. It’s a well established fact that home buyers look more favourably upon backyards with sheds, too- few of us, after all, don’t have a stash of something or other that just doesn’t fit in the house, or a passion for crafting one’s own pungent cheeses (ok, so not that many of us make our own cheese. Alex James from Blur does, however, and he seems like a decent sort). If you’d like to learn more about the many different options available in backyard sheds, visit www.nationalsheds.com.au.